governor of Abia State and Governor of Rivers State. The above image was given to one of our correspondant by Mr melody ezekiel who stated that the ways of men are not the ways of God due to what he has seen in the supreme court ruling over the upholdment of rivers and Abia state election. 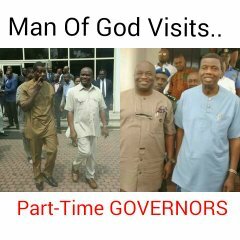 He said that he has kept this image for sometime now after someone shared it on facebook in respect to make mockery of the visitation by the two governors to the man of God after he appeared in their various states,of which they never had that meeting with the man of God for any political issue but it occur to be retweeted. PUO reports gathered that the young man was said to be overwhelmed with joy and happiness due to the supreme court ruling yesterday in abuja and in conjunction with the victory of Governor wike in Rivers state as of Wednesday 27 of January 2016.which he tagged to be double celebration. He also adviced the image editors to be mindful in their write ups,and that he believes that the picture was coming from the root of the All Progressive Congress (APC) members who tends to be myopic. He said why he had to boldly throw back on this image is because it is now crystal clear that the meeting with the man of God has restored the governors their mandate and hope in their various states and has prove the edited image authentically wrong.